Cordray’s resignation offers hope to some Ohio Democrats who think one of their own can win the governorship in Ohio again, now that Republican John Kasich, who has held it for two consecutive terms, is term-limited. 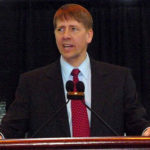 A former Ohio Attorney General before tackling his duties at CFPB, Cordray is no stranger to Ohio politics, having won offices in Franklin County and the Statehouse. His long-anticipated entry into the race for governor also throws a potential monkey wrench into the campaigns of the current five Democrats who have declared their candidacy to win the highest office in the state next year. The fifth and newest entry, Ohio Supreme Court Judge William (Bill) O’Neill, said he wouldn’t run if Cordray does. O’Neill will have to reevaluate his statement to not be a competitor to Cordray, who lost his last race in Ohio tp now second-term Attorney General Mike DeWine, a Republican candidate for governor next year. The Ohio Democratic Party has promised to stay neutral on the candidates and their campaigns. ODP says candidates must undergo party vetting in reflection on what it didn’t do with the party’s gubernatorial candidate in 2014, Ed FitzGerald. Vetting will apply to Cordray as it has the current crop, now that the former Jeopardy! champion has been liberated from DC duties Republicans, especially President Donald Trump, have been headhunting him for months over. What Dayton Mayor Nan Whaley, State Sen. Joe Schiavoni, former U.S. Rep. Betty Sutton, former state Rep. Connie Pillich and Justice O’Neill will do now in light of Cordray’s potential candidacy is unclear. After Cordray resigned his post, Whaley’s campaign took an indirect jab at Cordray for giving up his power post to a yet-to-be named Trump appointee that promises to be Cordray’s polar opposite on protecting consumers from bankers and other lenders bent on fleecing them. What is clear going forward is this, ODP will have its hands full deciding whether to urge any of the current candidates for governor to bow out to clear the field for Cordray, engage in behind-the-scenes moves related to positioning any of the current declared candidates for down-ballot positions including state auditor (Zack Space), attorney general (Steve Dettelbach), state treasurer (Rob Richardson) or secretary of state (Kathleen Clyde)? Or will ODP follow Darwin’s law of political survival and let losing candidates for governor go home empty handed?